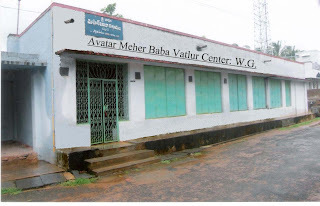 Avatar Meher Baba Vatlur Center is located on the Highway ( Free way) at about 4 Kilometers from Eluru towards Vijayawada. It is very near to Eluru. at present. All this work was done by raising donations from the Public of Vatlur village. Gatherings will be held on every Thursday and Sunday from 6 pm to 7-45pm. Beloved’s Bhajans, songs and messages are the regular programmes on these days. Special Sahavas will be held on the precious days like Amarthithi, and Beloved’s Birthdays etc. Yarlagadda Prasad, Yarlagadda Jhansi, and Vegunta Rajendra prasad. I am a retired Lecturer in History. I came into Beloved's fold in the year 1989 actively, passively from 1982. Two friends are responsible for my becoming Baba's lover. Ofcourse it is the will and wish of the Beloved. Because no body will move towards Him without His Will. I used to visit Meherabad for the first time in 1992. Thereafter many changes have taken place in my life and carrer. My experience with Baba's love may run into pages if I explain. Baba said He will not perform miracles. My experience is that He performs them in quite natural way that they do not appear as miracles.